Industrial Death with a tad or two of Thrash. Unfortunately, Sybreed does not quite rhyme with ‘explode.’ If it did, perhaps one could obtain a more accurate view of what, exactly, would happen to your head if you were to turn Slave Design up to max volume on the stereo. The sonic destruction would be ever so bowel-loosening. 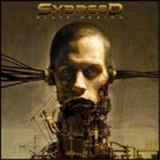 Sybreed is a four-piece from Switzerland who lists Strapping Young Lad as an influence on their music, and place City on their list of flawless albums. No offense to them, but the SYL connection was incredibly obvious. It’s practically worship, rather then influence. Luckily, the songwriting, musicianship, and general execution of the album almost entirely makes up for the lack of originality in the concept. Sybreed’s songs are characterized with a liberal blend of Fear Factory influence, City-era SYL as mentioned above, and a tad or two of Meshuggah here and there. The guitars are used much as they would be on an early Fear Factory album- to repetitively but addictively churn out deathish thrashy riffs with inhuman precision, but with much more brutality then any FF albums I can remember. There are industrial electronic sound samples used, but not too often, which is a drawback. Drop is very good at what he does, and should really be included in songs in a manner other then background noise. The production isn’t very distinctive- it sounds almost exactly like the production on City- but it’s excellent and gives every instrument adequate breathing room. Unfortunately, the singer is way back in the mix, but it’s preferable to Bringer of Blood-style production, eh? The singer himself is a great frontman, it sounds like. He can do a Devin-ish scream that sounds like the warranty on his lungs is still nowhere near expiring, he can actually SING, and does at a couple points, he can do a good high-pitched grunty shriek… this man can do it all. Major kudos on the vocal delivery, but I wish it was further up in the mix… it would be so much better sounding if that was so. The lyrics are an odd duck indeed, taken as a group. The title of this album is a great title, considering the lyrical content, which deals with things such as adaptation or extinction, how chaos can plague an unprepared mind (IE: any mind), and how society views violence as the only viable solution to really anything these days. Perfect lyrics, considering the music. Problems? The same most can have with the recent SYL album (bet you didn’t see THAT coming...): The musicianship is great, the songwriting is great, the electronic passages in-between things are great… but it wears thin after a while. Doesn’t quite give you a Meshuggah headache, but boy, is it tiring to listen to all in one sitting. Song by song: I can’t really do a song-by-song here, since they tend to blend together. My favorite songs, however, are distinctive enough to be identified: Bioactive has a really cool electronic middle passage that showcases the programmer’s sensibility and talent, Machine Gun Messiah has my favorite lyrics and a few hot as hell riffs, Take the Red Pill brings with it a sugar-rush of aggression that eventually led to me punching the wall, and Synthetic Breed’s title brought back fond memories of New Breed. The song itself was pretty good as well. I suggest to Sybreed that they take more time to write songs in the next album: though a couple of the songs are great, none of them are the sort of thing that make you go ‘YES, YES, YES! That’s EXACTLY what I wanted to hear!’ They should also not try to mimick SYL so completely, at least in the production. Move the vocalist up a bit, would ya? In summary, this is a great album that I recommend to fans of SYL, disgruntled Fear Factory fans, and really anyone who appreciates tornadoes of sound that could probably level cities if harnessed correctly.